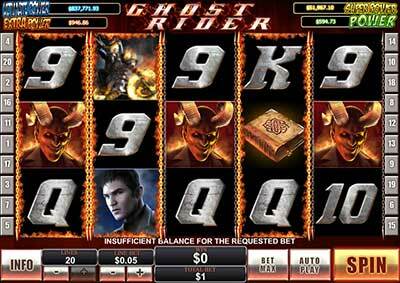 Overview of the Ghost Rider slot. Some of the most popular comic book slots are also the most simple and direct. A great example of this is Ghost Rider, which like the title character is large and in charge with no messing around! This game was released in 2013 and continued the legacy of this unmistakeable character, which has been seen in both comics and movies. This flaming, demonic figure stands out in the Marvel universe for being dark and dangerous. This Playtech slot is popular throughout online casinos. The setup follows a typical 5-reel game with plenty of options, win lines and animations. The fiery feature round should please fans of Johnny Blaze, as will the 3D intro movie. This is a staple comic book slot and a good place to start for new slot players. This game suits the style of the source material well. Let’s look at the game and the character in more detail. Ghost Rider tends to be overshadowed by the biggest names of the Marvel universe, but he has a cult following. Ghost rider comics have been around since 1972, starting with the bike stuntman Johnny Blaze selling his soul to the devil. In return he is bound to a demon and when evil is around, he becomes the fiery Ghost Rider with a flaming skull and motorbike. This dark, supernatural superhero is about as memorable as they come, so it’s great that Playtech’s slot really captures the right atmosphere. Ghost Rider is not just a comic. There have also been two major movies, Ghost Rider and Spirit of Vengeance, both starring Nicholas Cage as Johnny Blaze. Thanks to big budget special effects, these movies portrayed the Ghost Rider and his signature flaming skull in amazing action. Ghost Rider is not gone, however, for he now appears in the Marvel TV series Agents of S.H.I.E.L.D. This slot game, which was produced after the movies, goes for an art style somewhere between the comics and film. This slot game is a good example of how casino games have improved graphically over time. Even this relatively old game shows the progression well. When you first log on to the game, you’ll see a brilliant animated movie showing how Johnny Blaze turns into Ghost Rider and defeats demonic spirits. This also introduces the look of the characters from the slot’s symbols. If you don’t see this, click on Preferences at the top right and make sure it isn’t disabled. This game has the tagline ‘get ready for the ride of your life!’ and the game really is very fun. You will see various themed symbols like demonic tomes, contracts in blood, devil figures and Johnny himself for the best payout. The flaming skull of Ghost Rider is the wild symbol which seems fitting! To really cap things off, when the Ghost Rider appears on a reel, it becomes wreathed in flaming chains! This is a 5-reel slot which is pretty typical of modern video slots. You have 20 win lines here, also called pay lines, because each one represents a bet you can make and a way to win. Click each number down the sides of the reels to see them, or click Bet Max to choose them all, but keep an eye on how it multiplies your stake. Look out for the Ghost Rider skull, which is wild, but does not substitute for the logo or bike symbols. In free games this becomes an expanding wild. The logo symbol can grant you free games if you get three or more anywhere in view. Look out for the rider on his bike, which actives the reel he lands on. You can keep playing until he activates all 5 for the ghost hunt bonus round, where the game really shines. Here you can watch Ghost Rider tear down the highway, slaying ghosts for cash! Last but not least, this slot has the four-power level system seen on a few Marvel slots. You can activate this progressive jackpot game on any spin at any time and it involves picking symbols from a grid, aiming for 3 identical symbols.